When you want to leave the troubles of modern life behind for a moment, there’s no simpler way than taking a relaxing retreat to your man cave. For guys, these cherished spaces allow us to slow down in a fast paced world and refresh our minds. For many men who have families, the man cave may be the only space in the house that they can truly call their own. It’s a space uniquely designated for masculine energy and interests. Our man caves also are our own personal sanctuaries where we can honor the assortment of memories we’ve collected throughout the years. It’s where we keep the things that matter most to us like our trophies, photographs and even the collection of baseball cards we’ve had since we were boys. A man cave is like your wardrobe. It’s an opportunity for you to show off your unique style and personality. 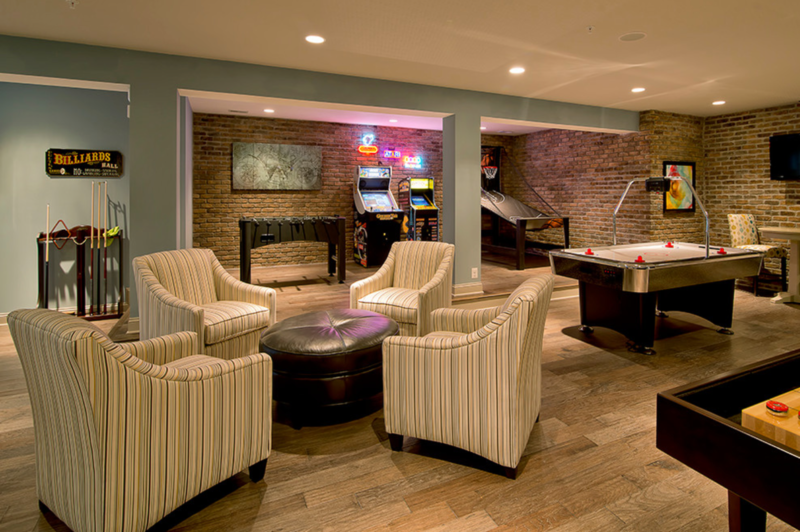 Of course, man caves are also popular spaces for entertaining. 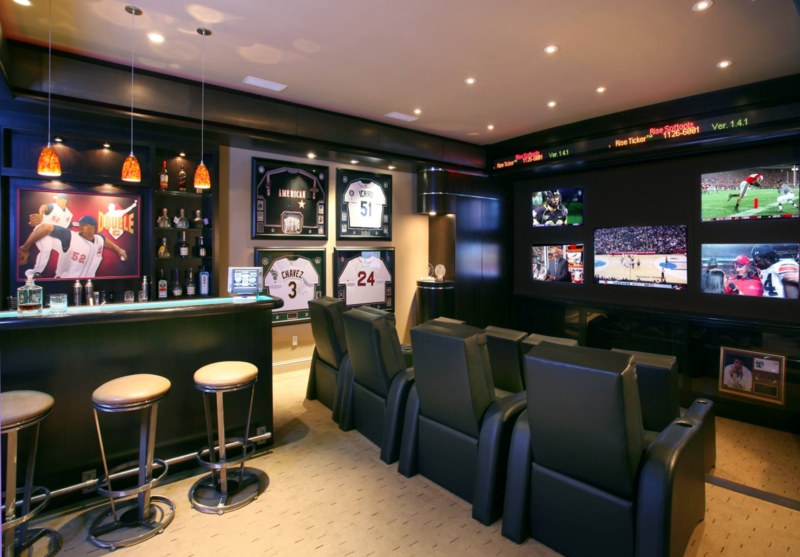 Home theater, sports rooms with pool tables, even indoor basketball courts are just a few of the ways guys use their man caves to have fun with friends after a stressful day out in the world. 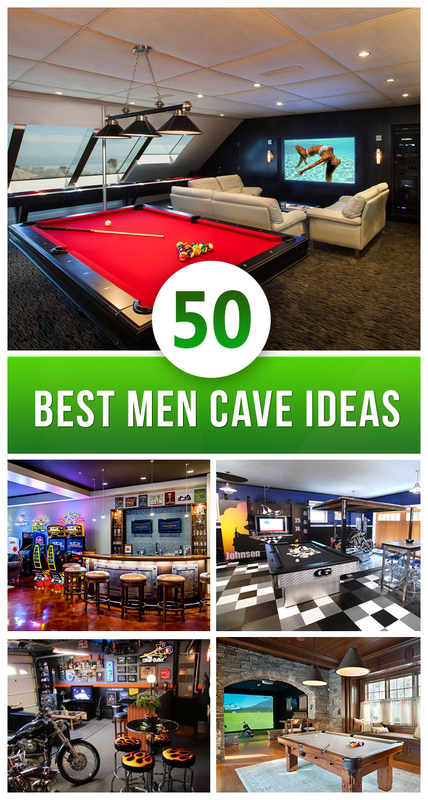 Check Out The 50 Unique Design Ideas for Man Caves to Fit Every Personality! We all have our unique ideals on what a man cave should be, and that is exactly the point. Just like there isn’t one right way to be a man, there isn’t one right way to design a man cave. Finding your own style is part of the fun of creating your man cave. But just because your man cave is your own, doesn’t mean you have to create it on your own. 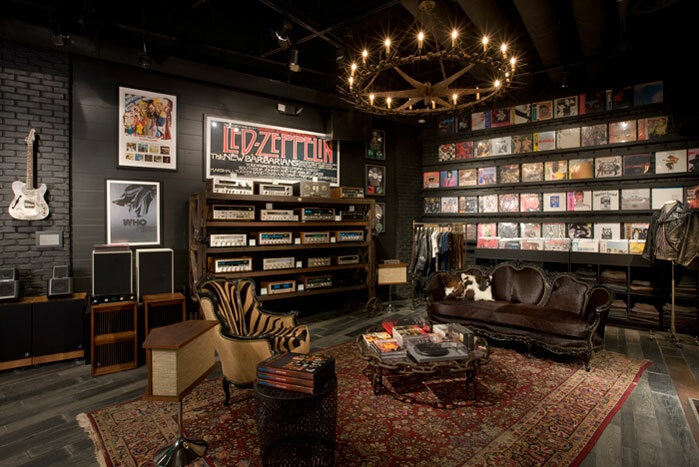 Check our list of fifty innovative and interesting takes on man cave decor and get inspired! The exposed brick invokes the warmth of a fireplace in a rustic log cabin. Utilize that rustic imagery into your man cave by featuring exposed brick into your DIY man cave ideas. It doesn’t matter whether you decide on an entire wall or an entranceway like in the example photo. The rustic woodsy colors of the exposed bricks will provide rich inspiration from which to choose your color palette. In the image shown, the cool gray of the brick meshes well with the warm wooden architecture. The harmony between the brick and the wood naturally draws one’s focus to the sunlight flowing in from the window. When entertaining in your man cave, it matters that your space be pleasing to the eyes. However, it’s important to remember that your man cave is still your home, it has to be inviting and comfortable as well. The clash between style and comfort is something many home designers face when dreaming up their man cave. The design aesthetic in this example manages to provide the best of both worlds. The comfy chocolate colored leather couches are positioned in a half-circle to create space a communal atmosphere. Flashes of color inside the display cases keep things interesting for the eyes, too. 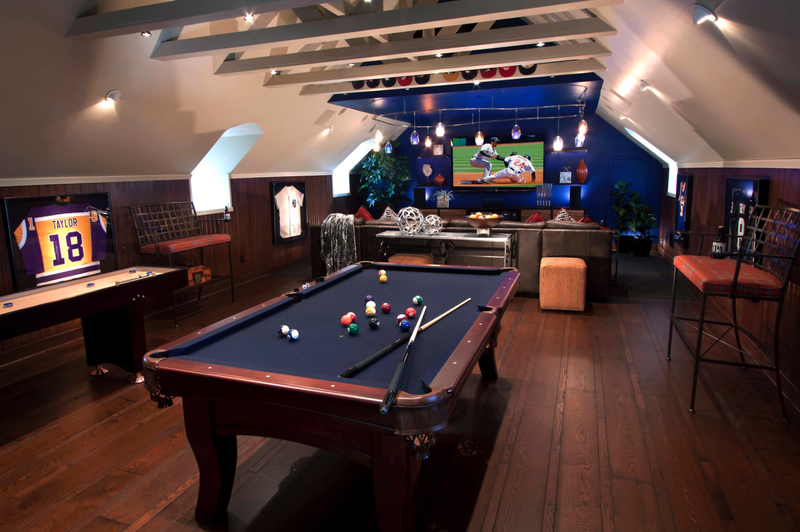 Some of the best man cave ideas seek inspiration from all aspects of a man’s life. This particular example creatively captures the arcade bar experience and brings it home to be enjoyed whenever. The bar seamlessly transitions into the arcade providing a user experience that ensures you don’t have to wait for the ice to get cold for your beer. The fun display of bar memorabilia also enhances the realism of this space while also imparting individuality. The couches to the left can also be used for entertaining, separately or in addition to the bar. As seen in the photograph, the unique ceiling design and unusual window angles offer depth and personality to this man cave’s design. The cool steel gray of the ceiling creates a modern look that compliments the black color of the walls. The carpet on the floor brings this all together by tying in both gray and black in its mottled design. Lastly, the bright red of the pool table provides some much needed visual contrast and prevents the room from feeling too sterile. 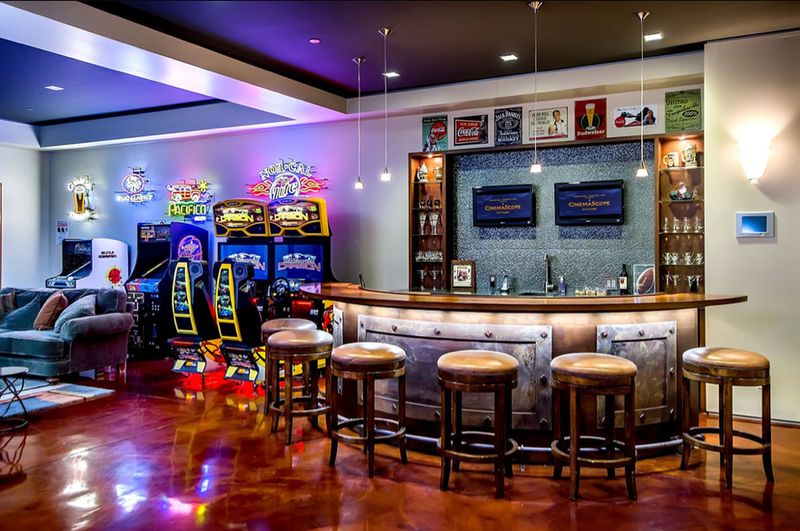 If you can work it into your budget, one of the most interesting ways you can turn your man cave into a entertaining extraordinaire is to replicate the sports bar look. In this example, no detail goes ignored. From the jerseys to the television screens and even the bar itself, this relatively small space has been completely transformed. There’s even a scoreboard above the televisions. Soft lighting and tasteful decor, however, keep this space from feeling noisy or crowded. Instead, it’s just the right amount of intimate and relaxed. Brown is a popular choice for the modern man cave. It is attractive because of its status as a neutral color. But neutral doesn’t have to mean boring. In this example, brown is utilized for its cozy and warm qualities that turn this man cave into the perfect space for socializing. The jerseys on the left wall provide an interesting visual contrast against the fireplace on the opposite side. The clever use of lighting draws your attention straight ahead to the multiple screens in the distance. 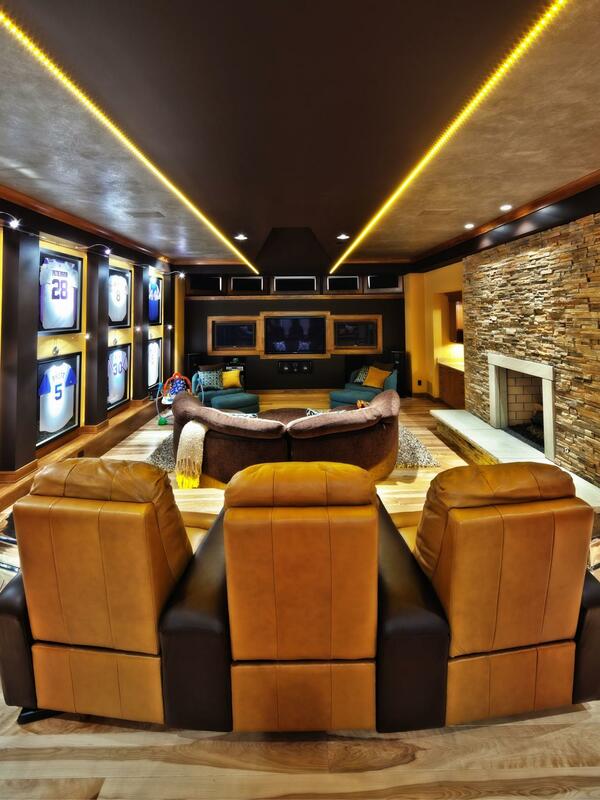 This combination of distance and intimacy strikes the right balance in a man cave for entertaining. One of the most challenging aspects for designing a man cave is the intelligent use of lighting. In the example image, the clear focus is on this space as an audio workshop. The use of ambient lighting is positioned to create an atmosphere that gets the creative juices flowing. The dark colored DJ equipment and the spicy burnt sienna of the walls help to create an ambient environment that works well for inspiration. Sometimes the best way to get ideas for your man cave starts with the little details, as shown in the example photo. The unusual geometric design of the walls is reminiscent of sheet metal, something that makes perfect sense for a male-centric bar aesthetic. All of this ties together nicely with the black furniture which further heightens the modernist style of the room. While the room is a little on the small side, the open windows help add space and keep it cozy rather than cramped. For most DIY man cave ideas, the design of the space is just as important as the purpose of the space. Rather than create a cramped and cluttered room of wall to wall sports memorabilia, this example showcases a sophisticated design aesthetic. This room takes advantage of the unique design of the ceiling to visually separate the pool table from the home theater. In addition, furniture is also used to visually designate these separate spaces. Pay particular attention to the red chairs on the left and right side of the room. At the same time, this sophisticated design still maintains common man cave elements like the jerseys lined across the room. 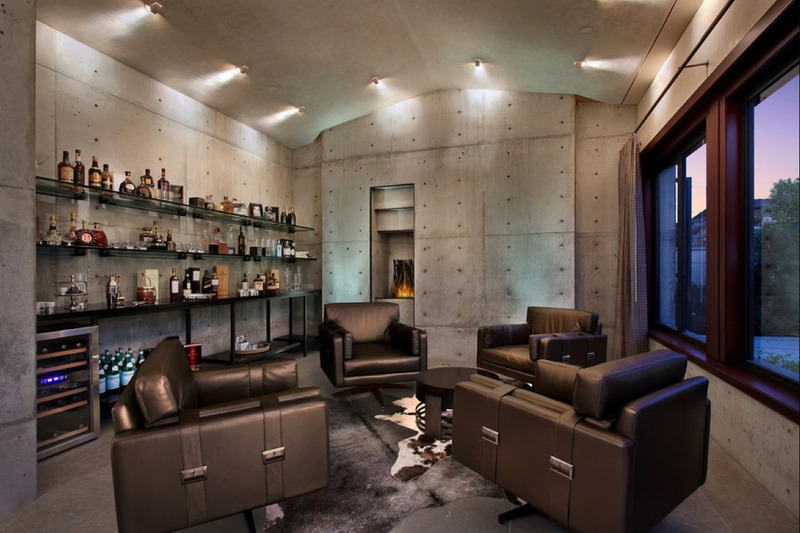 This man cave has an inspired geometric feel to it as a result of the unique patterns on the set of sofas in the room. 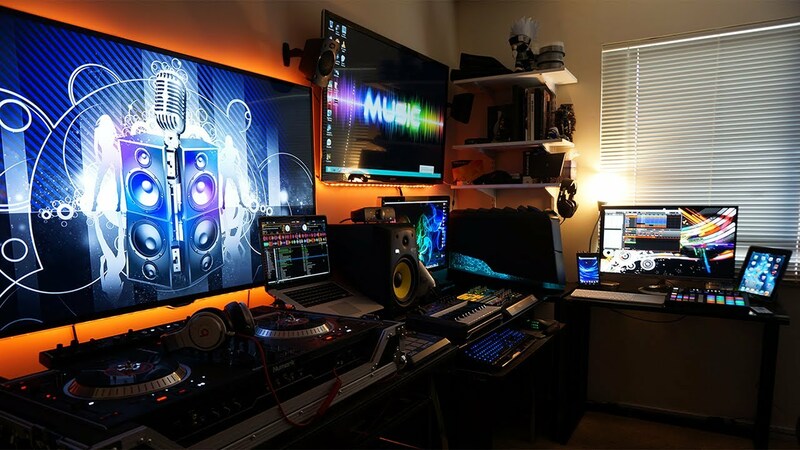 That isn’t all that sets this man cave apart from most. The use of unconventional color also creates a striking statement. All too often, men can be afraid of color when it comes to the decor of their man cave. However, when done right it can be masculine and individual. A background painting reinforcing the blue gray of the walls further showcases the audacity of the design. It’s an inspiring look at just what you can do with your man cave. 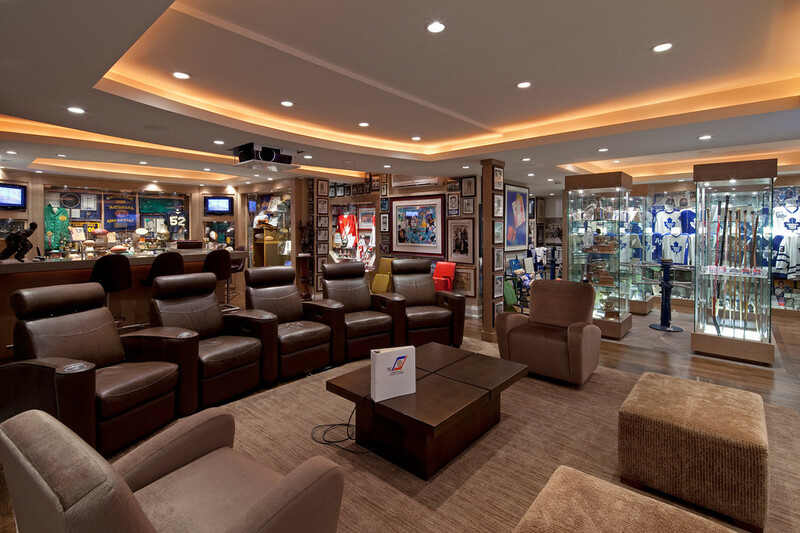 Not all man caves need to be centered around a sports room or home theater. In this photo, the walls are decorated in tribute to various rock and roll bands from the 70’s. In addition a guitar can be seen to the far left of the room indicating that this room also functions as a practice room. The rock and roll aesthetic is tastefully blended with a country style as seen in the elegant design of the carpet, the couch, and the chandelier. This isn’t your typical man cave. It shows that what you can do is only limited by your imagination. Using a chandelier is an excellent way to make a spacious room feel more cozy and inviting. Chandeliers help draw your eye downward, which is a handy trick in a room like this one. The chandeliers in the example photo also provide gentle lighting which makes the room feel even more warm. The warm theme is continued with the cherry wood ceiling. At the same time, the sectional sofa helps prevent the space from feeling too intimate, making it just right for entertaining. The jerseys and helmets on display work to reinforce the masculine aesthetic. One of the exciting things about planning your man cave is finding a unique way to showcase your personal interests and hobbies. It doesn’t have to be a challenge. In this example, action figures are encased in stands to create a personal museum. The dark color scheme and ambient lighting within the display cases creates an awe-inspiring atmosphere of reverence. This space could have easily been one of clutter and disorganization. 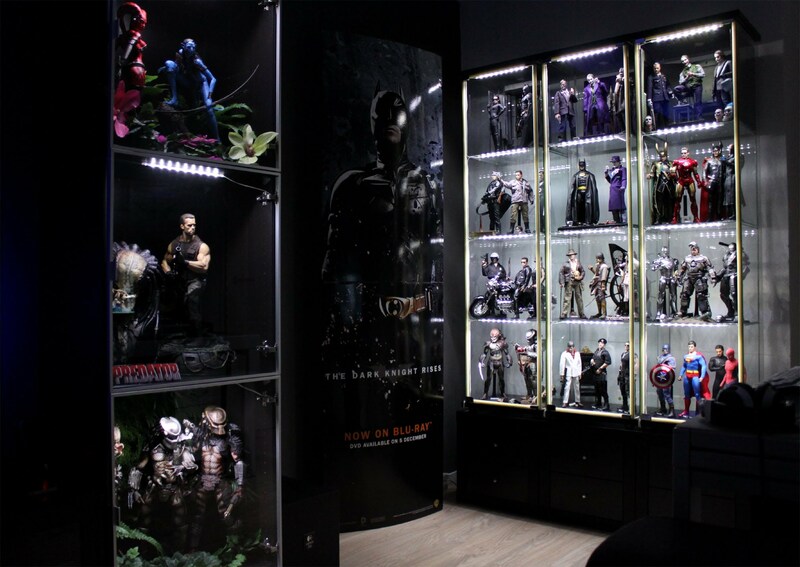 Instead, the clever use of the display cases prevents the chaos of having the action figures strewn throughout the room. The movie poster as an accessory is another smart choice. 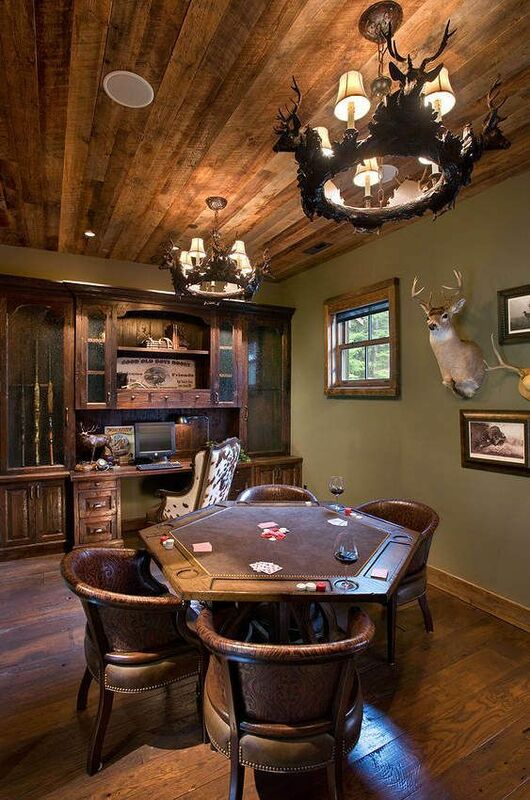 Even if you don’t happen to live near the woods, the rustic look has long been a popular style for man caves. It makes sense if you think about it. after all, the average man spends most of his time during the day in offices or surrounded by steel and concrete. Creating a nature themed man cave, allows you to escape the stresses of the modern world in every sense. In the example photograph, nature plays as much a role inside as it does outside. The timbered ceiling contrasts well with the camo green. Both work together to invoke a hunting theme. Bucks mounted along the wall and on the chandeliers continue the hunting theme.